Sure, you’re an old sushi pro at this point, but what do you know about poke? Now that we’ve collectively gotten super into sushi and are OK with the idea of eating raw fish (remember how weird everyone thought that was even just 10 years ago? ), poke is hitting it big. And thank goodness! What’s not to love about a bowl of lightly seasoned fresh fish served atop a bowl of rice? 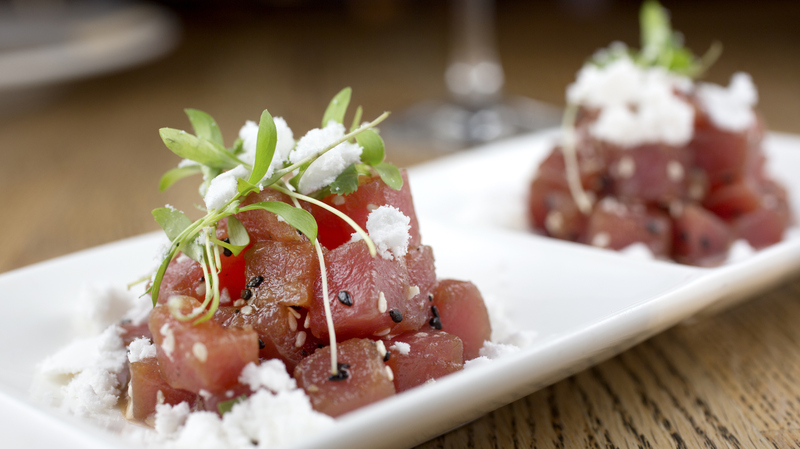 Poke (pronounced POH-keh) is a Hawaiian raw fish salad that is taking the world by storm. It usually consists of raw ahi (yellowfin) tuna seasoned with shoyu (Japanese soy sauce) and is garnished with onions, limu seaweed and inamona (roasted crushed candlenut), among other toppings. These days you can find all kinds of poke, from tuna and octopus to tofu and salmon. But if you can’t find it at a restaurant near you (yet), here’s everything you need to know to try making it at home. Tuna and salmon are widely available at supermarket fish counters, but the quality can vary wildly. Many people recommend looking for sushi- or sashimi-grade tuna, though the term is unregulated. “‘Sushi-grade’ is an unregulated term, so although it implies freshness, there is no guarantee. Although, no store wants to get their customers sick, so if they call it ‘sushi-grade,’ it is most likely the freshest,” Michael A. Young, executive chef of Sheraton Kauai Resort in Koloa, Hawaii, told SheKnows. For the best results, skip the grocery store, and head to a local fish market to find the freshest seafood. If you have a Japanese supermarket in your area, you can often find high-quality fish there too. “What it ultimately comes down to is, how well do you trust your fishmonger? Will they tell you the story of the fish and assure you of its proper handling? Here in Hawaii, I feel confident buying fish for poke at any grocery store because it is such a staple that anyone selling bad fish would get beaten up on the coconut wireless within a day. On the mainland, I would only purchase fish for poke from a trusted fishmonger with a great reputation,” Chef Young told us. If you don’t have access to a fishmonger, consider frozen. Fish that was frozen as soon as it was cleaned and butchered will be a lot tastier than anything of dubious quality you might find at the grocery store’s seafood counter. Once you get your fish, what to do? You probably want to get chopping right away, but experts recommend you freeze your fish first to kill parasites. In fact, in the U.S., all fish that is served raw is required by law to be frozen first, with the exception of tuna. Luckily most fishmongers do this to fish that’s going to be eaten raw before you purchase it, but you should always ask before digging in. How important is this step? “I would desperately hope that all the sushi we eat is frozen,” George Hoskin, director of the FDA’s Office of Seafood, told The New York Times. But you don’t have to worry about a change in the quality of the fish once it’s thawed. “Even I cannot tell the difference between fresh and frozen in a blind test,” Shin Tsujimura of Nobu told The Times. If your fish hasn’t been frozen, wrap it carefully in plastic wrap, then wrap in foil to help prevent freezer burn. 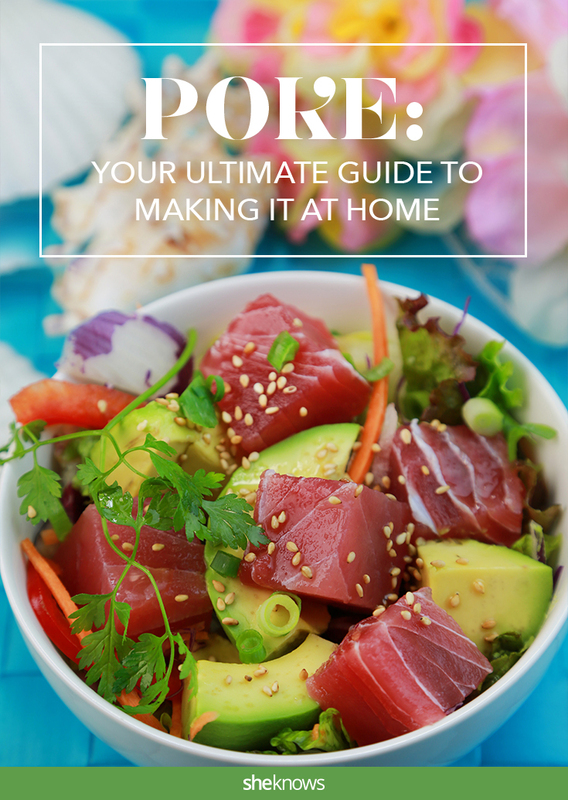 After your fish is frozen and you’re ready to make poke, you should remove it from the freezer and thaw it in the fridge until you’re ready to start slicing. If your fish has been safely prefrozen, “the fish should be left as purchased from the fishmonger until it is ready to be made into poke, right before it is consumed, ideally the same day. Every time the fish is handled, the chance of cross-contamination is increased. Plus, if you are using ahi, the most traditional fish, it will begin to oxidize after it is cut and lose the beautiful color and luster that makes it so expensive,” Chef Young advised. Since you are eating the fish raw, make sure your hands, cutting board and knife are spotlessly clean before prepping the fish so you don’t introduce any pathogens into the meat. “Preparing raw fish is a joy but needs to be approached with a certain caution. Because it is not actually cooked, the utmost care needs to be taken in making sure that everything is clean and sanitized, from the knife and cutting board to the vessel it will be served in. Raw fish mishandled becomes a petri dish for things to grow that are very unkind to the human body,” Chef Young warned. Make sure there are no scales or bones still in your fish (if you purchased sashimi-grade fish, there shouldn’t be). Using a sharp knife, remove any skin or sinew that you can see. This will depend on the type of fish you’re using, but it should be minimal. You also want to make sure you use a very sharp knife when cutting your fish, and clean as you go. “One should take care when cutting the fish, as it can quickly gum up a knife. Allow yourself plenty of time to cut the fish, and wipe your blade with a clean towel and cool water whenever it gets too sticky. Use a sharp knife. Safety first,” Chef Young advised. You can be flexible with how you season your poke, but you don’t want to drown out the flavor of the nice fish you just spent all that time preparing. Traditionally poke is served over a bowl of white sushi rice that’s been lightly seasoned with rice vinegar and maybe tossed with some chopped kombu. The fish is dressed with just a little bit of shoyu, sesame oil and sea salt and maybe tossed with slivered Maui onion. Crushed red pepper or diced red chili can be added to give it a kick. The dish is then garnished with limu seaweed and crushed inamona (which can be swapped for chopped, toasted macadamias or cashews) along with a sprinkle of sesame seeds. 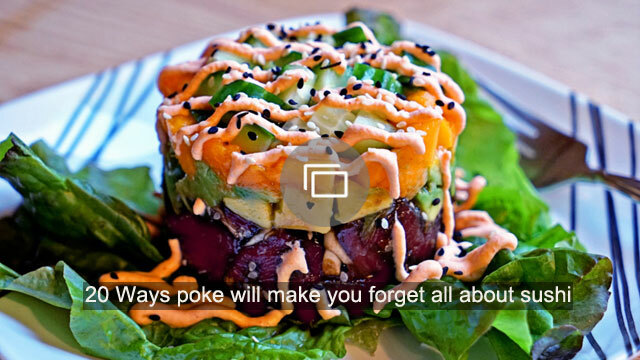 These days, people get a lot more creative with their poke. You can dress it with a spicy, creamy sauce made from Sriracha and mayo, add cherry tomatoes and even watermelon to the fish before dressing it or serve with crispy wonton strips on top for a fun textural contrast. Once you master the basics, exploring the many ways to make poke is as fun as it is tasty.